Customers that bring in an iPad 4 for repairs to authorized Apple service centers or Apple stores may have their device replaced with an iPad Air 2. Talk about getting bumped to first class. With the release of the 5th generation iPad, the stock of older devices is starting to dwindle. 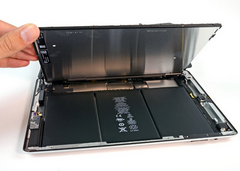 Apple stores and authorized repair technicians are starting to face supply shortages for older tablets like the iPad 4. In order to combat this problem, Apple is now authorizing repair staff to replace broken 4th generation iPads with the newer iPad Air 2, according to an internal memo. Customers that bring in an ailing iPad 4 may also get a bump in storage as a bonus; while the iPad Air 2 is no longer sold by Apple (the iPad 5 replaced it last month), the latest models sold were 32 GB or 128 GB devices. That means that 16 GB or 64 GB iPad 4’s could get replaced with a higher capacity iPad Air 2. Keep in mind that this policy does not constitute blanket coverage. Whether or not a replacement should be issued is still up to the individual managers’ discretion. However, given Apple’s track record of long term device support (most tablets and phones are support for about 5 years), it wouldn’t be surprising to see this policy widely adopted across the country. Also, keep in mind that there may be some additional cost for the repair or replacement of an iPad 4; don’t expect to bring in a broken tablet and walk out with a free iPad Air 2.